Top 10 Fireworks of 2018 | Order directly online at Dynamic Fireworks! The 5th of November is almost here and preparations for Bonfire Night 2018 are in full swing! Now that autumn has most definitely arrived, we’re all thinking about the best fireworks to buy for home use this Guy Fawkes night. The one question we get asked the most: what is your favourite? As it’s impossible to answer that with just one firework, we wanted to give you our top 10 fireworks of 2018 to buy, across a whole range of different types. Which means there is plenty to choose from, whether you have a small garden or want lower noise fireworks. Kicking off our top 10 is the Brocade Crown with Colour Tip Parade. This incredible candle is packed with 175 shots which fire rapidly, producing thick glittering gold brocade tails to red stars, blue pearls and purple tips. This beauty is low noise and really stands out with its vivid colours and is ideal for small gardens with a 8 metre safety distance.. If you are looking for something different, then our spinning Lotus Flower Fountain is perfect for you. This unusual concept is a fountain which spins on its axis, emitting silver plumes up to 5 metres to create a stunning lotus flower. Something you certainly won’t see elsewhere! New for 2018, our Blue Peonies and our Pink Peonies are simply gorgeous. Not only do they bring colour and charisma to your display, they are also perfect if you are looking for an inventive gender reveal! These barrages are part of our new Pro Effect range, and promise you big effects, vibrant colour and big bursting fireworks. Lasting 20 seconds, you can buy these as a standalone firework, or as the finale of a display. These impressive barrages will be sure to create the perfect moment. If you really want to impress, then we would thoroughly recommend our Mayhem Mine, which is promised to stun your guests! Send a shockwave through your display with a huge flash of golden glitter finishing with vast brocade crown bouquets. Mines are a quick flash with a noise effect, indeed at five seconds with a noise factor of 7 out of 10 this definitely meets that criteria. Mayhem can come as a trio along with its siblings Chaos and Havoc. Buy all three mines for only £30, saving £12! King of Palms is loved by many for its intensely bright bursts. Packed with 15 shots of varying angles, colours and effects, this barrage is sure to stun with its glittering palms and strobes of white and red. Perfect for the lower budget, this firework packs a punch and is superb value for money, especially as part of our special offers you get another firework free when buying this. Everyone loves a rocket, and this Hulk set does not disappoint! The Hulk Rocket 4 Pack of 4 premium quality and mammoth rockets are a true spectacle. Mixing red, blue and gold, the colours are simply stunning. These rockets are sure to give you the impact their name promises. Named after the man himself, Guy Fawkes and the other plotters, this is one of the best fireworks to buy for home use as our Conspirators of 1605 barrage is a ‘display in a box’. It is loved for exactly that reason. Lasting an impressive 60 seconds, you get a breath-taking variety of effects. Starting with tails and crackles, this barrage then ramps up to colourful bursts and spinners, finishing with a final volley of silver bouquets. Worthy of the name Zeus – King of the Gods – the Zeus Rocket 4 Pack of 4 superb professional effect rockets are big and brash with sky filling, long hanging bursts. However they go beyond just filling the sky, offering spectacular effects of rings and crowns too. Without a doubt, Snow Storm has to be our favourite barrage. Don’t be fooled by its name, as Snow Storm is perfect for displays all year round! Intense white mines shoot skyward, while a glimmering white waterfall cascades to the ground, creating a stunning snow effect. This is a particular favourite for weddings, and stands out spectacularly against a dark sky. 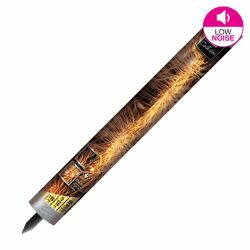 We couldn’t recommend a brighter, more brilliant firework lower noise piece. Indeed we love it so much it is often used as part professional displays and formed part of our display at the festival of Fireworks. Coming in at number 1, and without a doubt deserving of the top spot, is our spectacular Icon. This hefty beast combines 3 barrages into a single firework, yet as it is a compound firework you light one fuse, which gives you an impressive duration of two and a half minutes. 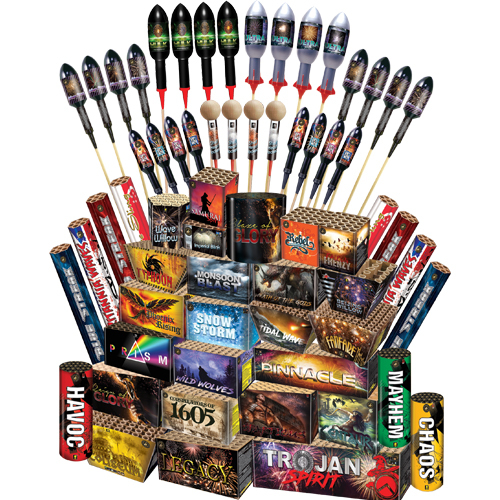 This is guaranteed to blow your display away with dazzling yet thunderous effects, including silver blink mines, colour star bouquets and a crackle brocade crown finale. This is the definition of WOW factor! Buy the top 10 fireworks of 2018 online! So there you have it, our top 10 fireworks of 2018. But you need to be quick! These beauties are not just our favourites and are guaranteed to fly off the shelves, often with many selling out before the 5th November. So don’t leave it too late and avoid disappointment!